Easy peasy baby overalls, the babies in your life will look very smart in these cute overalls, put them over a little T-shirt or to make a set pair them up with the easy peasy baby cardigan. Worked in one piece with a variegated yarn, it is a quick and easy design to crochet, using sc and dc stitches. 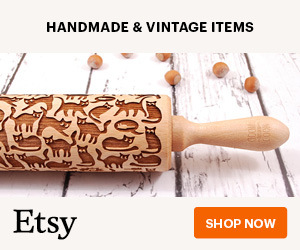 Make for your family and friends little ones. Row 2 – ch2, 1dc in base of ch2, 1dc in each dc to end, sl st to first dc on beginning of row. Turn. Rpt last row until 13 rows have been worked or your work measures approx 6 Inches. Turn. Divide for legs – ch2, 1dc in base of ch2, 1dc in next 44dc, sl st to first dc on beginning of row, turn leaving 45dc un-worked which we will come back to for second leg. Repeat Row 2 until 12 rows have been worked from division. Turn. Rib Row – ch2, 1dc in base of ch2, * 1fpdc in next dc, 1bpdc in next dc, * rpt from * to * to end, sl st to first dc on beginning of row. Turn. Rpt Rib Row once. Fasten off. Left Leg – Return to un-worked 45dc at division, rejoin yarn with a sl st to next stitch, work the left leg the same as the right leg. Starting each row with ch1, 1sc in base of ch1, work 2 more rows of 1sc in each sc, slip stitching and turning at the end of each of the rows. Fasten off. Rpt Row 2 until 9 rows have been worked or work measures approx 4 Inches. Turn. Rpt Row 2 twice. Fasten off. With WS facing return to the unworked 24dc on neck edge, skip 13dc, rejoin yarn with a sl st to next dc, continue on these 11dc and complete the same as the first side. Fasten off. With RS facing and starting at lower edge by waist band, work 23sc evenly up first side of bib, 3sc in corner, 9sc across shoulder, 3sc in corner, 23sc around neck edge, 3sc in corner, 9sc across second shoulder, 3sc in corner and 23sc down second side of bib. Turn. Starting with ch1, 1sc in base of ch1, work 1 more row of 1sc in each sc around all sides on bib front to end. Fasten off. Rpt Row 2 until 12 rows have been worked in all. Turn. Next Row – ch1, 1sc in the base of ch1, work 1sc in the next 10dc, turn leaving 24dc un-worked. Buttonhole Row – ch1, 1sc in base of ch1, 1sc in next sc, ch2, skip 1sc, 1sc in next 5sc, ch2, skip 1sc, 1sc in last 2sc. Turn. Starting with ch1, 1sc in base of ch1, work 1 more row of 1sc in each sc and ch2 space to end. Fasten off. Return to un-worked 24dc, skip 13dc, rejoin yarn with a sl st to next dc, ch1, 1sc in base of ch1, 1sc in each of next 10dc, continue and complete the same as the first side. Fasten off. With RS facing starting at lower edge by waist band, work 27sc evenly up first side of bib, 3sc in corner, 9sc across shoulder, 3sc in corner, 19sc around neck edge, 3sc in corner, 9sc across second shoulder, 3sc in corner and 27sc down second side of bib. Turn. Chain Tie – ch130, Fasten off. Finishing – Close small gap on crotch, weave in any loose ends of yarn and trim off, sew 2 buttons on each shoulder to correspond with buttonholes. Turn through to RS, thread chain tie through alternate dc’s on waist tie with a bow. Enjoy making the easy peasy baby overalls guys and don’t forget to pin it to your boards please! Have fun until the next free crochet pattern. The written instructions and pictures for this free easy peasy baby overalls pattern are copyrighted to crochet ‘n’ create © 2017. 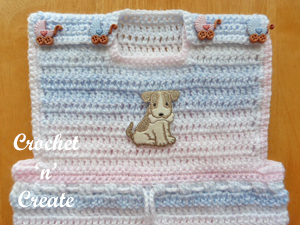 You are welcome to sell the finished products made from the free crochet easy peasy baby overalls pattern, I just ask that you use your own pictures and put a link back to crochet ‘n’ create. 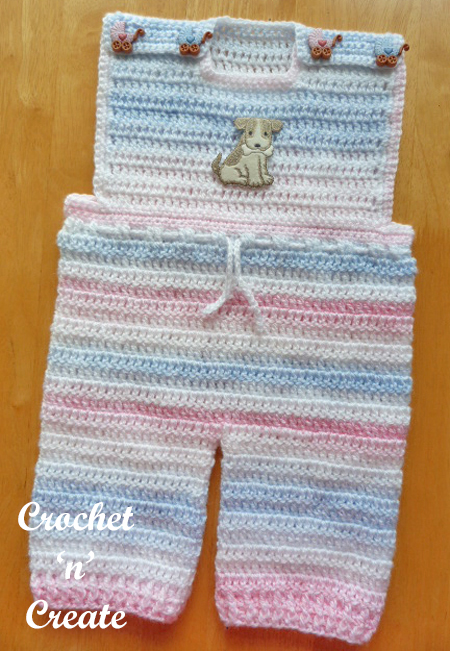 If you wish to share this crochet easy peasy baby overalls pattern on social media or your blog please only use a direct link to the pattern page on crochet ‘n’ create. 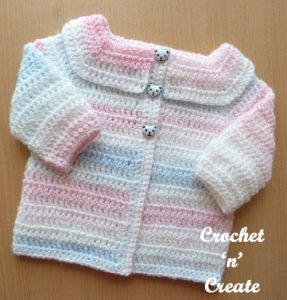 This entry was posted in Baby crochet pattern, free crochet patterns and tagged baby boy, baby crochet patterns, baby girl, free baby crochet patterns on 6th July 2017 by crochetncreate.